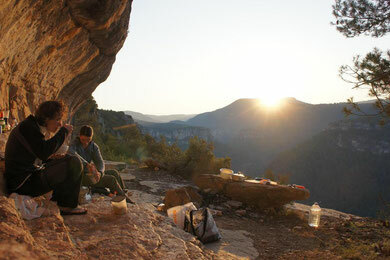 Breakfast and sunrise at Hotel Siurana. Hotel Siurana gave us a warm welcome when we came back from Terradets. Although I spent so many springs in this wonderful place I am always amazed about the abundance of routes here. Waiting for us! 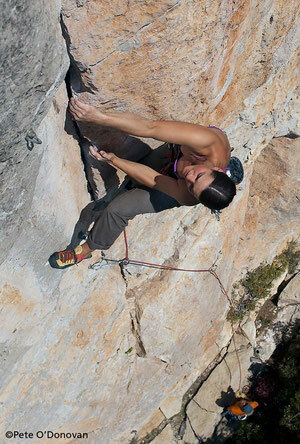 I started to work some routes, "Pati pa Mi" in El Pati and "Ramadan" in Siuranella Est. Both 8b, very different style though. Pati pa Mi is a 38m route with a thin and hard boulder problem in the middle after a 7c and a good rest. Ramadan is super powerful; almost a one-move-wonder with a subsequent 7c+. End of March the routes were ready to send but I had no luck or power...and the April weather came in, rain and storms. Chrissi flew back to Germany after sending his first proper 7c ("Hot knife" in the Negociee sector) congratulations, my rockstar!!! 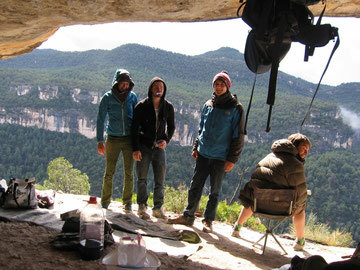 Daniel Jung climbed "Estado Critico" 9a in El Pati, very great effort, you are inspiring, yeah! 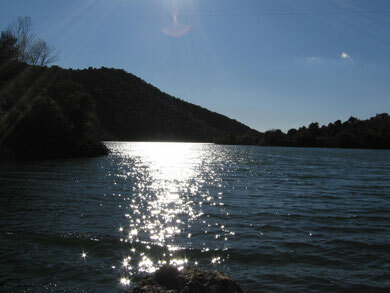 So with a lack of luck and love I got a bit unpsyched but then............Easter came with sending conditions to Siurana! I climbed both 8b's within three days: Easter Saturday and Easter Monday! Woohooo! Elisa, David, Moritz and Ferdi in ABC. Wind and rain made us move from Hotel Siurana to ABC: advanced base camp higher up in the Siuranean mountains. Jomo, Elisa, Tobi, Ferdi, Moritz and David enjoyed the Patagonia evaluation camp (I guess ;o)! Well, I got knocked down by a cold for a few days, no big climbing for me! Jomo getting mad from rock rings training in ABC. Mr. krec, 7b in Arbolí, sector El Dard. Damien O Sullivan belaying. Photo by Pete O'Donovan. Back on track we climbed in Arbolí with Pete O'Donovan in a Sector called "El Dard", technical crack and slab climbing in the sun. 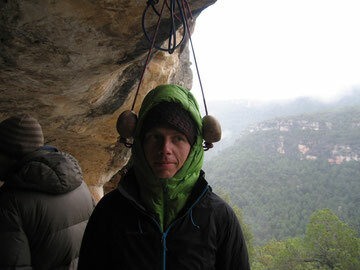 Photo session for his new guidebook "Tarragona Climbs", to be published soon!!! So last week now in Siurana. Daniel climbed two 8b+ in El Pati in one day and I sent "Pre Nota" the same day, a lovely and long 8a in Negociee! 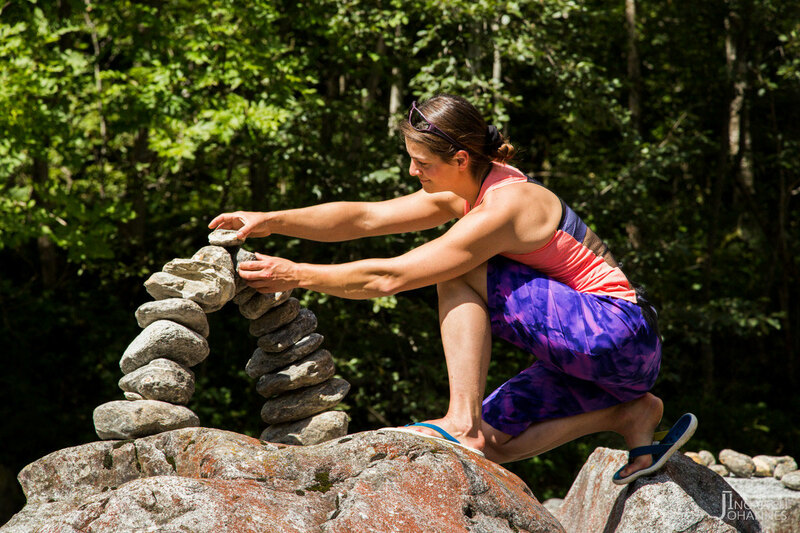 Highly recommended route, tricky, endurance, cool moves, 30m of pleasure! 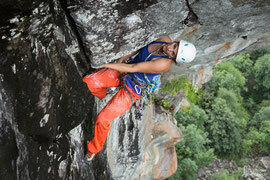 Soooo, I worked Kale Boroka, 40m climb, 8b+, overhanging, cragging, crimps...! I hope I can send it this trip, wish me luck!